There's not a lot of buzz about AC1200 class routers these days. Prodded on by router marketeers, buyers are opting for bigger numbers on their router boxes along with (much) higher prices. Yet AC1200 routers still can provide a performance boost over your current 802.11n router and are perfectly fine for networks in small spaces and only a few Wi-Fi devices. Many of today's mobile devices have only 2x2 802.11ac radios anyway, which are a perfect match for a less expensive AC1200 router vs. a three or four stream rocket ship. 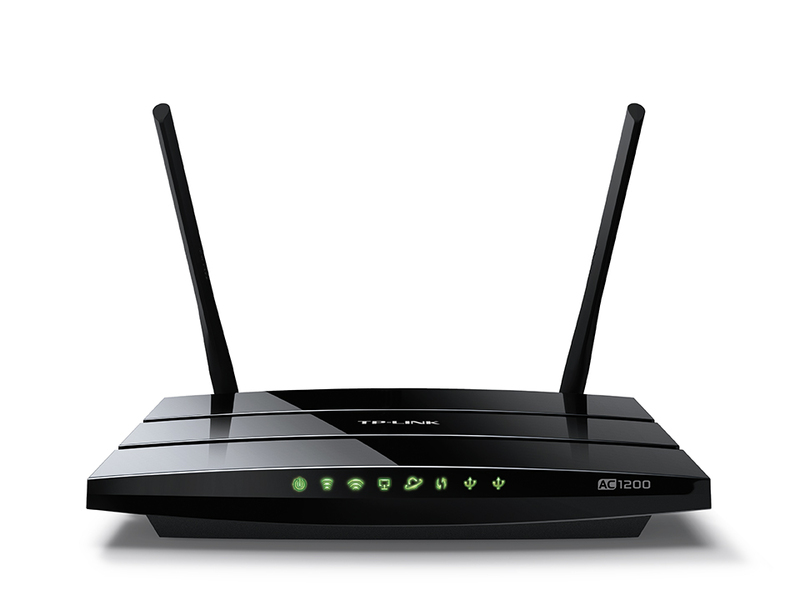 Which brings us to TP-Link's Archer C5 Version 2. We reviewed the original version of the Archer C5 in Part 1 of our AC1200 roundup. Version 1 Archer C5 was a bit of an oddball router. It was actually a de-featured Archer C7 (3X3 radios) with three external and three internal antennas. Firmware limited the 5 GHz maximum link rate to 867 Mbps, but the 2.4 GHz radio link rate wasn't capped. So it linked at 217 / 450 Mbps (20 / 40 MHz bandwidth) when used with a 3x3 2.4 GHz client. This gave the original C5 an unfair advantage that earned it a SNB #1 Ranked award. The Archer C5 V2 is a completely different animal based on an entirely different chipset. V2 is a true 2X2 configuration with only two antennas based on a Broadcom platform. We'll do a more detailed component comparison shortly. With the exception of only having two external dual-band antennas, the Archer C5V2 looks remarkably similar to the C5V1. The callout below shows the front panel arrangement and LED status legend. The callout below shows the rear panel configuration (left to right). Like the Archer C5 V1, the C5 V2 has a power switch as well as a Wi-Fi radio disable switch - features not generally found on many routers. The button at the extreme right doubles as a WPS/Reset switch. Table 1 compares the key components comparison between the Archer C5 V2 and original (V1). The image below shows the top of the TP-LINK Archer C5 V2 board with heat sinks and RF shields removed. The 2.4 and 5 GHz modules are at the upper left of the image; the Broadcom SOC is shown center right. Note the original QCA-based design used a router SoC with built-in 2.4 GHz 3x3 radio. The V2 design uses separate devices for CPU and each radio. Compared to the Archer C5 V1 board below, you can see that the C5 V2 is a completely different design. About all the designs have in common is the placement of rear panel components.